Just in time for the Fall season, today we’re sharing this gorge leaf backdrop that Emily and Brit of Ruie & Grace created for this shoot we shared a few months ago. Hold on to your glue guns, because this DIY project is incredibly easy for a Fall wedding! Take a look at the Leafy wedding inspiration that Tom and Keidi captured for more. *Tip: We chose butcher’s paper to keep our backdrop cost low, but you could use fabric or wood as well depending on where your backdrop is going! Butcher’s paper is very cost effective and can be found at your local hardware store in the paint section. *Tip: Save money by sourcing your magnolia leaves around your city, instead of ordering online. We raked under many of our friends and neighbors magnolia trees and gathered four full trash bags, more than enough to do our project! 1. Sort your magnolia leaves by hue, so you can easily install rows of leaves. 2. Spray paint your pop color on an assortment of magnolia leaves and let dry. 3. Place your background material of choice on the ground and start glueing your leaves! We used about a dime sized of hot glue per leaf and held for a few seconds before moving on. *Tip: We mapped out on our butchers paper when to switch colors, making it very easy to install. Just use a pencil to draw division lines with the color of magnolia leaf noted. We chose to make our backdrop go from dark to light, darkest color at the top fading to the palest at the bottom with gold intermixed. 4. Glue your leaves onto the backing material row by row with some overlapping. 5. When you are about two rows away from your division line, start intermixing your next hue with the current hue to blend and make the transition soft and feathered. If you don’t blend, your transition lines will be harsh and not as subtle. 6. Continue glueing until you reach your desired height! Our project took a total of eight hours (not including sourcing of leaves). *Tip: Try changing the angle of the leaves, using various shades of spray paint, or altering the shape all together to tailor this idea to your taste! Email us with any questions or advice, we will gladly help! 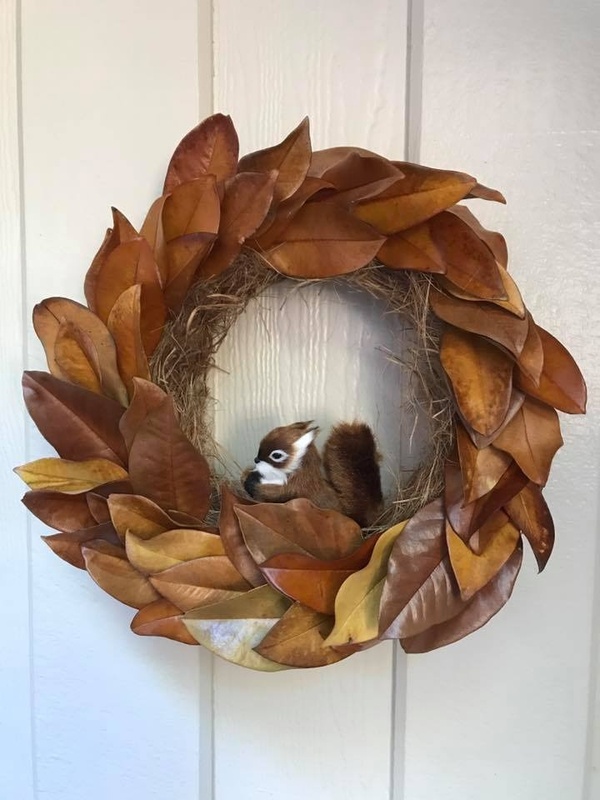 Such a great idea, and soo many leaves in my garden, love this! This came out great! Thinking of doing some sort of leafy backdrop to add more of that autumn touch to our reception next year. The venue isn’t as “rustic” as our theme would suggest, so I think it would be a nice contrast. Would it be ok for home decor? How long do you think the leaves would last? I have the same question as Rosey. This would be a beautiful statement piece on a wall! If a smaller version of this was framed would it last? What other colors of spray paint did you use besides gold?